I have no idea why this happend in this flight, probably I missed something. On the last 10 flights, no problem. If I set to managed speed, it goes down to 134. Approach Phase is not activated. 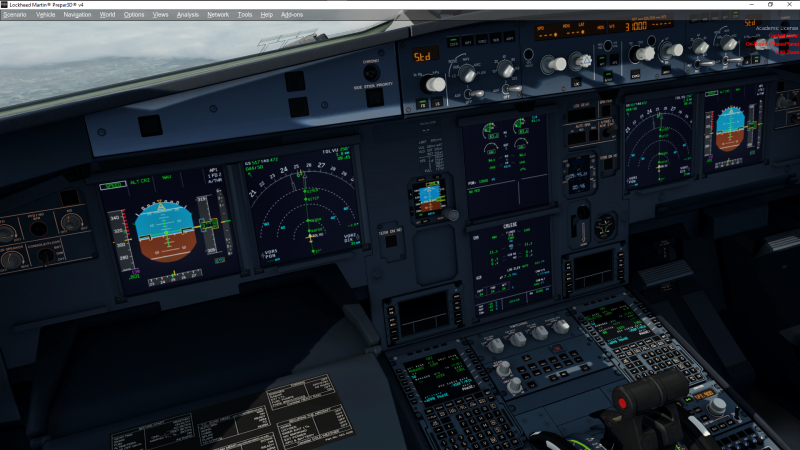 Flying the A321 CFM Sharklet Version (latest Version). I have just had the same problem in cruise. Managed speed drops, I have had to turn off the Autothrottle. Something not quite right with the latest update it seems V1.2.1.3.A320 model All other flights have been without problems. 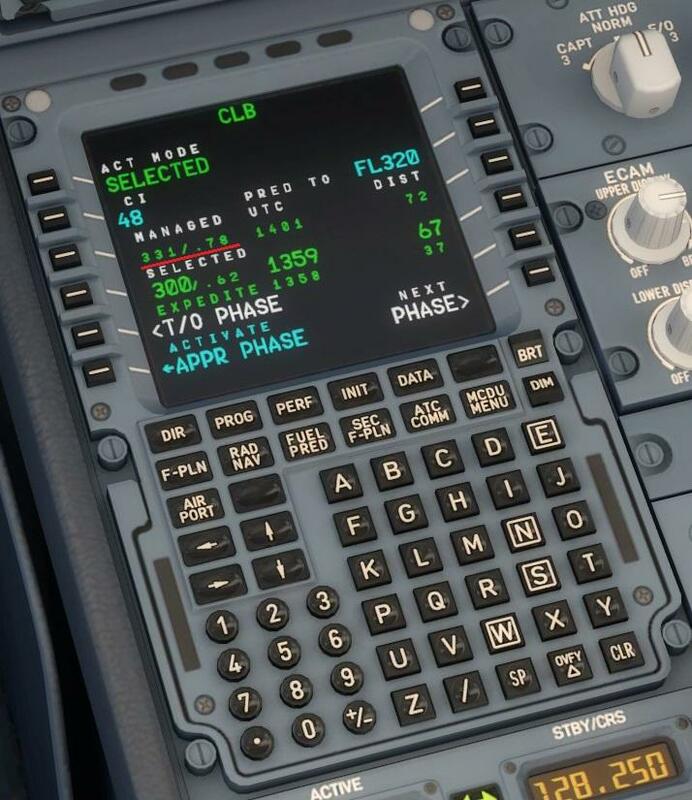 I continued without restarting the sim the next flight, LPMA-LOWW, no problem on this flight. We are trying to recreate this. 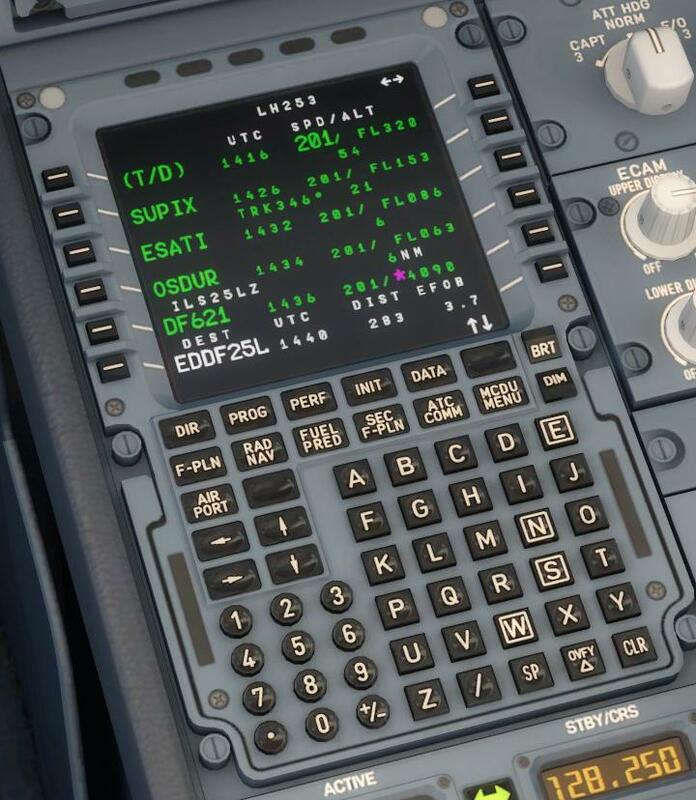 I managed to get into the situation depicted in the first screenshot yesterday while flying EFHK/LOWI. I was messing with the arrivals while on cruise when suddenly the managed speed went to approach speed. I loaded up second flight plan and everything was well again. I've had this twice now on a flight from ESSA to ENTC. First on climb out of 01L, target speed went from correct 250 to V2 on it's own. Second issue on cruise with a change to the arrival, suddenly target speed went to V2 or there about again. I also have the same Problems. I´ve had to stop the managed control and put the Hand on normal Autopilot Speed - managed route heading is working - and the Altitude by selecting manuell the climb and descent rate. Ultimately, I wasn't able to successfully use managed speed until final approach. Even at around 10,000 feet, it was still targeting low; about 230 kts even though there was no speed restriction in the FMC. Curiously, in an attempt to solve an unrelated issue, I reloaded an autosave that had been saved during cruise, at a point well after the problems began and just for curiousity's sake I pushed into managed mode and voila - it was working properly (! ); targeting either M0.78 or 0.79 (I forget which, exactly). I'll be attempting the return leg to KFLL probably tomorrow, so I'm curious to see if it happens again - or if I should just be boring and put it in manual mode after TOD! I can't discount that the issue is related to the 1.2.1.3 update as I don't believe I had flown an entire flight of the A321 IAE since its initial release (which worked just fine, vertical profile issues notwithstanding, on a similar duration flight of 3+ hours). Any news? Same Problems here. i have suddenly the same Problem. Speed wants to reduce to 112. For now the work-around is to use managed speed mode or "rebuild" the flight plan using SEC F-PLAN. We are still unable to recreate this following all correct procedures. Do make 100% sure the MCDU is fully filled because something missing there could cause this. That would mean that when I install the latest full download it works but the last 2 updates I suddenly don't use the MCDU correctly. I will be again uninstall it and reinstall the last download before the updates until someone can fix it. The same happened to me yesterday night...the only strange thing I noticed was that i forgot to set the "engine start selector" to the middle position. I was flying with the selector on Start position. I don't know if this could be the cause of my problem. short update from my side: I did not have this issue on the last 20 flights. No Idea which behaviour does affect this strange "issue". I don't know if this could be the cause of my problem﻿﻿. 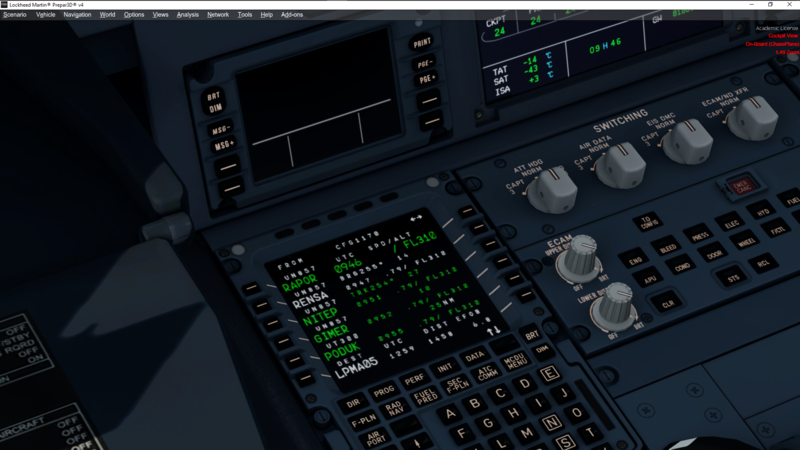 2) once loaded from Prepard 3d I change time of flight and then I select Cold and Dark state panel. 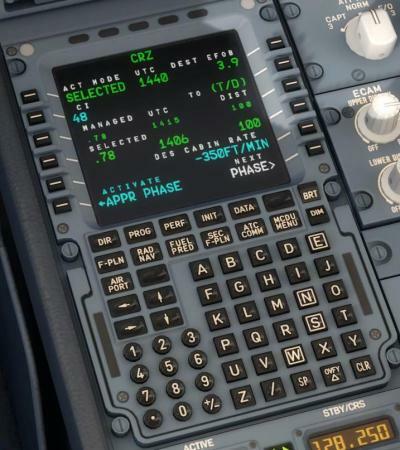 3) I wait 2 minutes waiting everithing is off till engine sounds go off then I power up the airbus. Maybe not but I think that testing from saved flights is different from direct loading aircraft. I'm having the same issues. 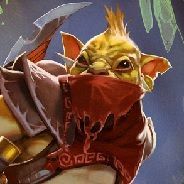 Managed speed is completely messed up. In Climb Phase the Init Page says Managed 331/.78 however FMGS commands 201 until Alpha Floor, in Cruise Phase the Speed is even set to 113, Decent Phase 201 again. Correct weights have been entered, wind has been uploaded. Btw, this was just the recent flight, I've been having the same issues for a while. Thanks for figuring out what went wrong! I uninstalled and reinstalled without the updates. Solves that problem. @Irishcurse Well that much was obvious! The bug didn't occure from the beginning, so clearly one of the updates must have caused the fault. Reinstalling without updates can't be the solution since the updates solved other bugs and/or brought more features to the bus. I cant stand using it with the speed issue. It affects the decents and such. I would rather roll it back than update and have it not work. Any other bugs are minor by comparison. I found a solution for my described problem: The Load and Fuel Page of the AS A319/320 calculates the wrong ZFWGC and Trim, the Fuel Planner comes up with different numbers. I used them instead and didn't have those issues described earlier. 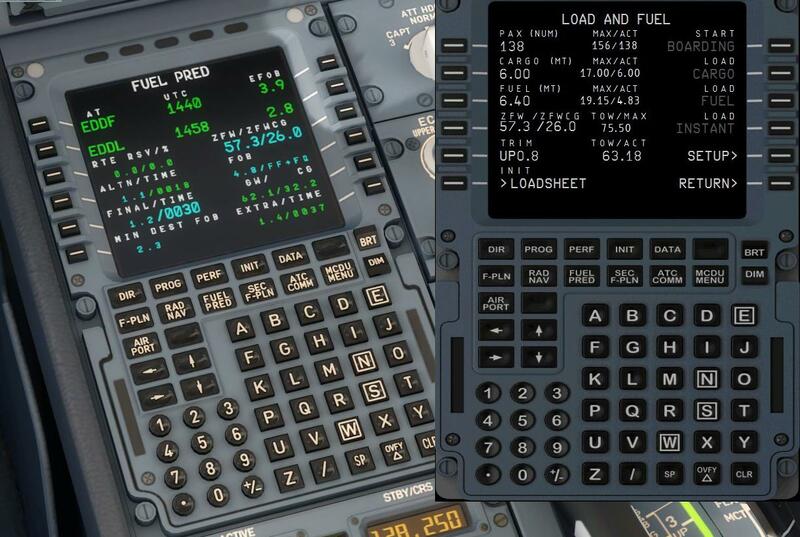 I noticed before that the Load and Fuel Page always showed ZFWGC 26.0 and Trim 0.8, I guess there's the bug. Just use the figures from the Fuel Planner and it should work.